We don't eat white bread. Usually. So when I deliberately buy any white flour product, I want it to be everything I imagined. For the past few years, I've been disappointed at Thanksgiving and Christmas with the traditional southern style rolls. Something was missing. If I'm going to eat white rolls twice a year, I want them to match my imagination. Recently, I bought rolls to serve my book club because characters in the book (Still Life by Louise Penny) were eating warm rolls. 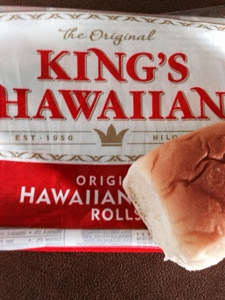 Also, I had seen these King's Hawaiian rolls at Costco and figured if Costco made a point of carrying them, in addition to their own bakery rolls, the King's Hawaiian rolls were probably pretty good. These rolls taste like the rolls of my childhood. When I imagine rolls, these are the rolls that I imagine. King's Hawaiian rolls are much sweeter than most dinner rolls, and you may not like them. My book club didn't mention them, and Bob seems to be able to take them or leave them, but I've found my fantasy rolls. I will definitely buy these for holiday occasions in the future. The airy white rolls cook very fast, just a few minutes at 300 degrees is enough to warm them. Rolls are 90 calories each and come in packs of 24.